Back to preschool for Mr. Ben today! He comes home starving, so I'm still trying to figure out the right amount of food to send him. Today's bento snack was more of a smaller bento lunch. He took turtle quesadillas (really, just cheese quesadillas sliced into turtles) plus a few extra square pieces underneath. He also had inside-out canteloupe and honeydew flowers, which I am totally impressed with for the cuteness factor! There are also regular chunks of melon underneath to make my job easier. For the flowers, I just sliced the canteloupe & honeydew into half inch slices and punched out the big flowers with a cookie cutter. I took a smaller cutter and cut out the inside flower and swapped the pieces. I could not believe how thrilled F&B were with these! We also made a "Carebear" with a teddy bear cookie cutter & a small heart, and some funny faces with animal shaped cookie cutters and a straw for eyes & noses. They are adorable! I finally ordered some cutters. What is the quesedilla made with? Love the flowers! Super cute! Love the inside out flowers! 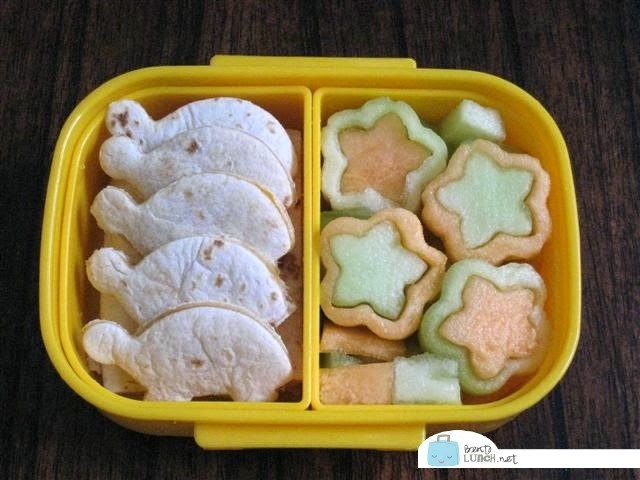 so cute bento!! I love it!! Amazing ideas on your blog. As is often said, we do partly eat with our eyes! Great way to get kids to enjoy their lunch. can you tell me what product (s) you used for the flowers?